I have found granny squares to be quite addictive. The actual crochet pattern, once you catch on to the rhythm, is so satisfying. And then there's the endless possibilities of color combinations. Not to mention the fact that I could just gaze upon anything made out of granny squares for countless hours, and maybe even more. 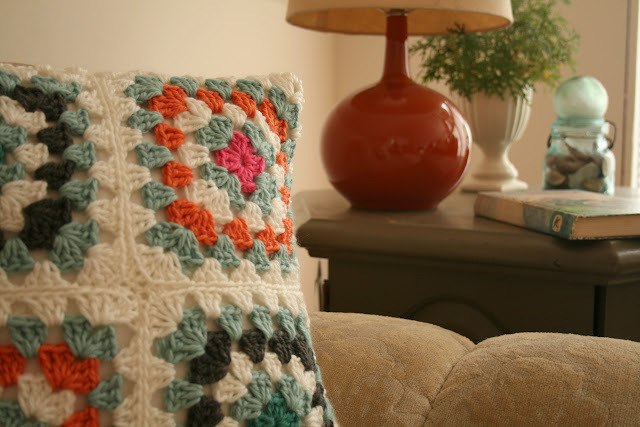 I found the pattern at The Yvestown Blog, via wisecraft. (Both favorites). These granny square pillows are 14 x 14 and backed with a piece of recycled vintage material, full of fun color combos, which inspire me daily. They also have an envelope style opening in the back. I'm bringing these babies to The Queen Bee Market, coming up on Nov.18th and 19th. The other thing I can't stop making right now is anything with a chevron stripe. Again, the color combo's are endless. These scarves are now for sale in my shop, $20 each. Flower pins are sold separately.